So my homestay is coming to an end pretty soon along with my semester. It's been alot of good times and alot of hard times. While going through it I cursed the country's name non-stop, having been through it, I can say that the homestay was worth it. Sure the 2 hour commute made me want to cut myself and sure the not being able to talk unless it's in a foreign language got difficult at times, but doing it the hard way is the best way and I feel I've learned alot. When I stop and look back on my first fews days I just now realize how much I've learned. My ability to speak has jumped dramatically thanks to having to speak it non-stop on a daily basis at home. 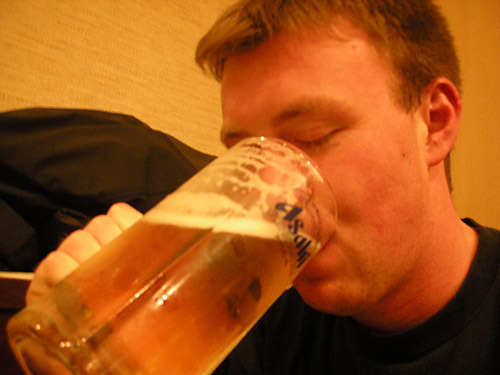 It's given me a great base for learning this language that I think will give me a real fighting edge. I've also learned alot of the small nuances and pieces of the culture and family life which I couldn't attain any other way. I also made a life-long bond with my Japanese family which is priceless. I'm really appreciative to all the family has done for me. But..I am really glad to finally stretch out on my own without being pent up by rules and family life and get to enjoy living on my own and being able to own a car again. Before leaving my host mom thought it'd be nice to round up the entire family and go to a restaurant. Great Idea I thought! Even the grandpa and grandma were going to come. I've been living here for 4 months and have never talked to the grandpa ever. He walks into the room mumbling, gets some tea, and goes back into his room everyday. He likes to keep to himself in his room and read so I never got a chance to know him or even what he did for a living before he retired. But luckily tonight that'd change. Oh Boy! Let's pack in the car! We went to yaki tori? I'm not sure of the name I don't remember. 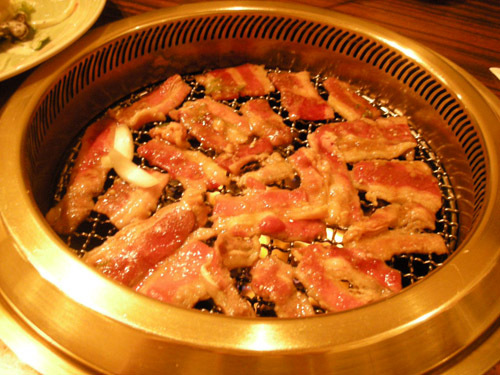 It's sort of like korean barbeque where there is a grill in the middle and you put strips of meat on it to cook then the community of people use their chop sticks to grab some meat then dip it in different flavorings. 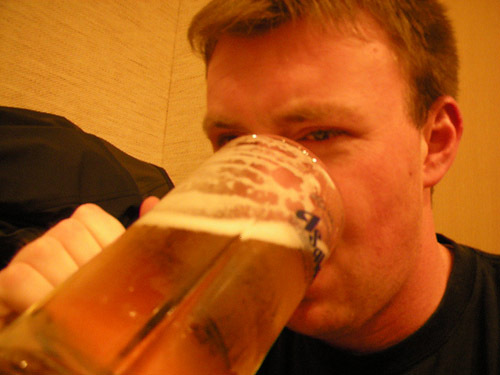 There's also delicious frosty beverages and vegtables to be had. So here is part of my family at the table. 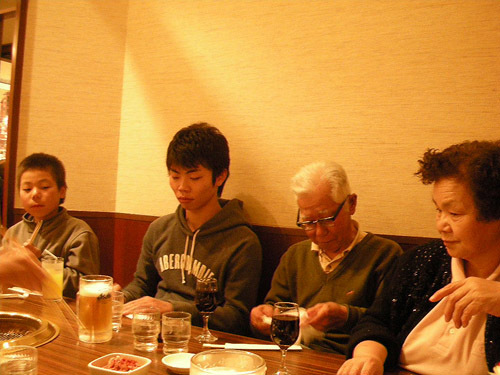 From left to right we have Ryuta, the 10 year old youngest of the family, Kenta, the 21 year old oldest son in the family (also same year college student as me), Grandpa, and Grandma. Here's some meat cooking away on the grill while I chow down on some 'salad'. And by salad the Japanese think it's necessary to add mayonaise. In fact, if they could, they'd add mayonaise to everything (even pizza, it's quite popular...unfortunately :cry . Here is some of the flavorings you put on the meat. 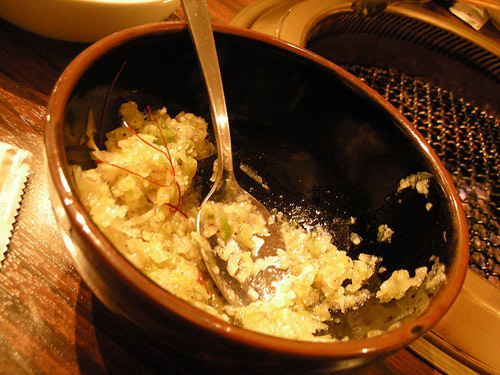 This is a negi and salt mix (negi is Japanese green onion, sort of). 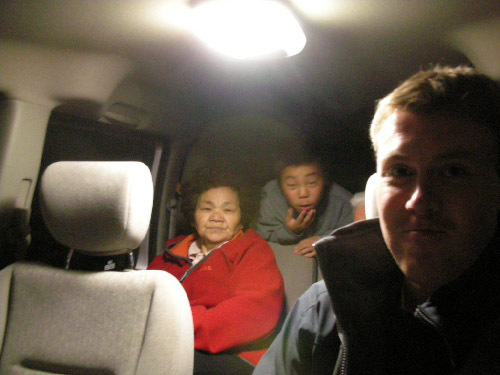 Here I am harrassing my host mom as I'm known to do from time to time. As usual she looks unimpressed and shortly after, scolded me. A small sidenote, a big social no-no is to shake your leg nervously, it's a sign of poor self-control. I do it constantly at the dinner table and get yelled at daily for it. Here is the rest of my family. On the right we have Arashi, the middle son of 14. On the left we have the Mom. Thumbs up for delicious food! 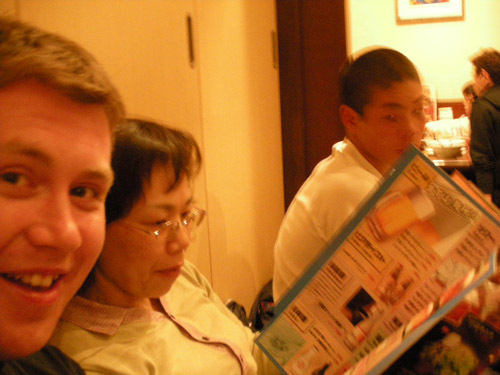 Unfortunately the last son couldn't make it cause he lives like 3 hours away going to college in Chiba. 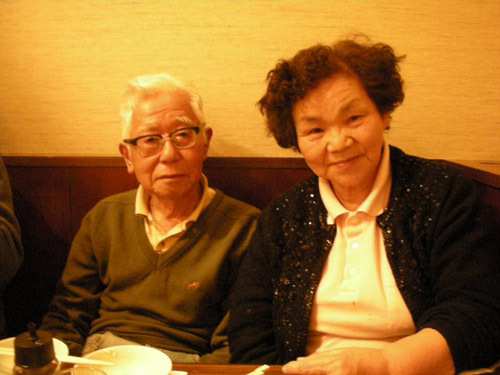 A nice pic of Obasan and Ojiisan (grandma and grandpa) that I took. Turns out he worked for JR (Japan Railways) for 30 or so years and started shortly after the end of world war 2 around 1948. This guy is oldschool as it gets. Nice man though, just have to really try to talk to him. The grandma on the other hand loved to take opportunities to talk to me and always expected me to understand perfectly and respond accordingly which didn't always happen. She also made a habit of making me a cup of hot tea in the morning and laughing at the mom when she scolded me for whichever overly-foreign thing I was doing. A thing I after-the-fact like about the family is they always treat me like one of their own. So that means whenever I'd do something unjapanese or a faux pas they wouldn't ignore it, I'd get scolded till I did it right to help me learn how things were done in their culture. Believe it was WAY frustrating at first as I didn't understand why I was being yelled at. The first month was really hard till I learned to talk enough that I started being able to converse with the mom to understand what was going on. 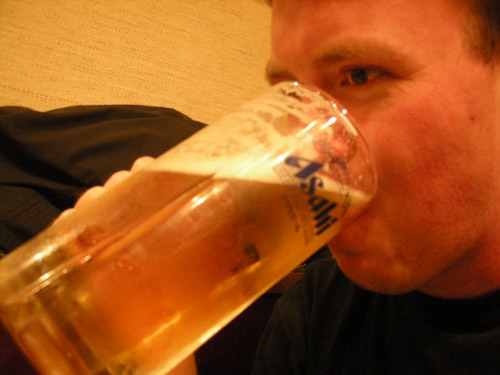 One of the only big things in Japan is their beer. 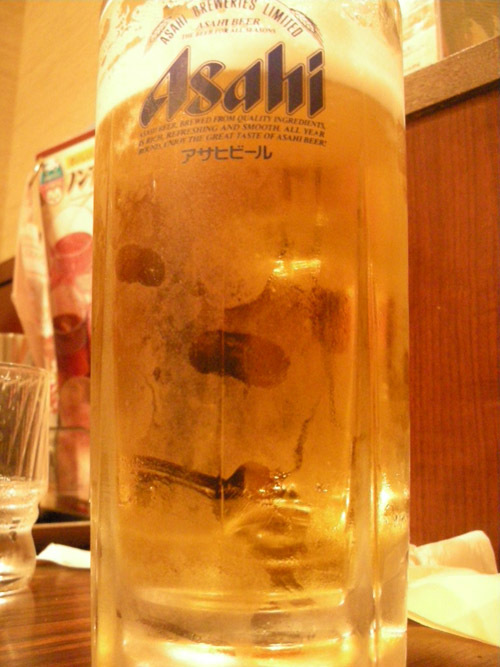 While I'm not a big fan of most of their food, their beer is my favorite. And the sizes are to my liking. 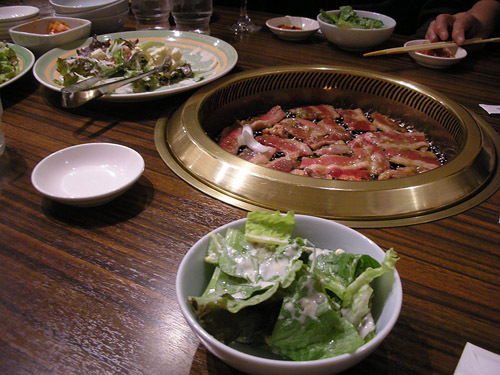 The dinner was delicious and I had a good time. We headed home after eating our fill and I continued to study for finals. While I was studying though I heard something from downstairs so I thought I'd investigate and take a picture. 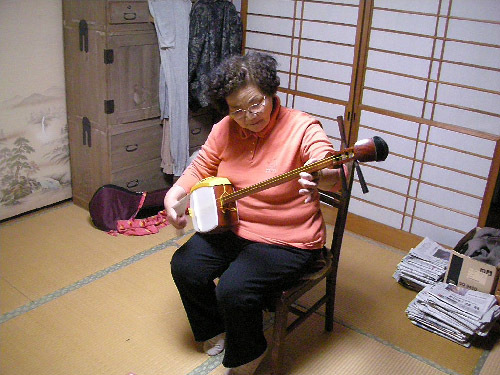 The Grandma is playing a Samisen (spelling?). The Samisen is a traditional instrument which You've probably heard if you've ever seen a samurai film. She usually practices at night to give the house a very Japanese feel to accompany my studying. thats pretty cool, definately sounds like youve enjoyed your time there.